Disability Advocates of Kent County strives to aid individuals with disabilities take control over their own lives. Disability Advocates began as the Grand Rapids Center for Independent Living, and in 2002 changed their name in order to more accurately describe the role they play in their community. Disability Advocates provides support for individuals in a number of areas including transportation, housing, employment, and education. The American Association of People with Disabilities' REV UP campaign is proud to coordinate National Disability Voter Registration Week, July 11-15, 2016. This week is dedicated to increasing the political power of people with disabilities and to engaging candidates and the media with the needs of individuals with disabilities. A blog post by Mark Stephenson of The Network, a Christian Reformed Church (CRC) website that connects members of the CRC community, highlighted the work that Disability Advocates of Kent County has done regarding political action in recent weeks. “Disability Advocates of Kent County knew who to contact,” Stephenson said. “The next day… [Disability Advocates] received a message from assistant to the mayor of Grand Rapids, Michigan, Amy Snow-Buckner, saying, 'Mayor Bliss is pleased to provide a proclamation for Disability Voter Registration Week.'" The blog goes on to state that individuals with disabilities not only have a “critical interest in policy issues,” but that if the “50 million people with disabilities voted as a block, they would [have the ability to] decide every single election for president.” This illustrates the importance that accessible polling stations, in Grand Rapids and elsewhere, play in the race for president. For candidates and communities alike to ignore the struggle of making polling places accessible is to ignore the needs and opinions of thousands of individuals with disabilities. 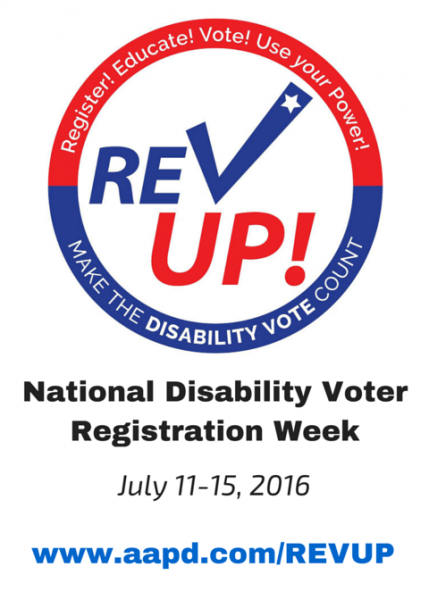 The American Association of People with Disabilities encourages community members to participate in National Disability Voter Registration Week in a number of ways. It suggests holding a press event or conference in order to announce efforts to get individuals with disabilities registered to vote and to educate the public about disability issues. Additionally, they encourage the writing of letters to local radio and television stations, using social media to provide information on voter registration and local disability issues, connecting with disability and voting rights organizations in the community and several other suggestions. The full list of recommendations can be found here. Individuals with disabilities who have had trouble voting in the past, or have questions regarding voting in Grand Rapids may contact Adelyn Van Tol.